Hey everyone, my 10 month old GSP has been having some stomach issues. We regularly walk at a large park with a pond in the middle. With it being so hot, I have been letting him swim in it, and he has been doing just fine. Two nights ago I caught him drinking from a puddle, and ever since then he has had diarrhea. Appetite is good, still drinking lots of water,gums are good and pink, still very active and overall a happy dog. I came home from work today and he has replastered the wall behind his kennel brown. I believe it is something to do with the puddle he drank out of, possibly Giardia. I got a appointment at the vet tomorrow, and I grabbed a stool sample to take it. I also picked up some Greek yogurt, I was planning on dropping him down to one cup of food in the morning and one in the evening, with a spoonful or two of yogurt. Any advice on what else I can do? Thank you! That's the problem with hunting dogs; they drink from ponds. Sounds like Giardia. See the vet as soon as you can. You can get giardia from your pet; do some reading here. Sounds like a round of metronidazole and amoxicillin is in your dog's future. Probably giardia, which isn't a huge deal, but you need to knock it out and the sooner you do it, the better. It could also be something more nasty than giardia, so don't screw around. Get thee to the vet. My dogs occasionally have had Giardia. They got it from our ponds that have beavers in them. Never seen them get it from a puddle. It does need to be checked out. Always glad to get an update on here. Thanks; let us know how it goes. Fact of life about bird dog's. You pretty much can't control what they drink and eat while your in the field. Friend of mine had two of his out for a run in the city park by a river once and there was algee in the water, not the main stream but back wash's. he took them home and both died on the way home. Could have been the algee or maybe they found a rotten fish to eat. 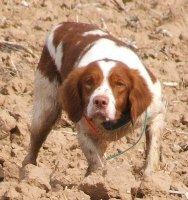 Bird dogs are their own worst enemy about thing's like that. Hope you dog is doing better but now! I have had a go with giardia. I used goat dewormer, fenbendazole, 1/4 tsp per five pounds of body weight for 10 days. Disinfect everything the dog uses with bleach, kennel, bedding, dishes, toys, etc, and allow it to sit for ten minutes before rinsing. Should clear it right up. The disinfecting needs to be done daily until you finish the 10 day course. You shouldn't have issues with reinfection either. You can sneak the liquid into the food or give it like a liquid medicine, either way works. Hope your dog feels better soon. If it were me I'd be taking in another stool test now, rather then letting the possible giardia get a better "foot hold". Not a strange question. People can get it easily by cleaning up the dog's diahrea etc. ; for me I'd be seeing my GP. edited for spelling : Never could spell diahrea. I hope you didn't just swap out dog foods in one feeding; that could seriously add to your problems. IME it works to change slowly over the course of 5-7 days. Didn't your vet give you any advice? My advice, non-vet of course, is to cut back on the dogs meals for a few. Overfeeding by just a bit can cause upsets, and cutting back or even fasting for a day can rest the gut. One last thing, I had a dog that had loose stools a off and on for years, and my vet told me that sometimes dogs get an overgrowth of the wrong bacteria in their small intestines that lead to upsets. He gave the dog a course of metronidazole when the dog got loose, and it cleared things right up. Whilst I would Not ! like to debate the rights and wrongs of food debate which has been thrashed out world wide . Dogs have been known to eat their own Sh*t , other dogs Sh*t ,and yes even human sh*t . ..Some even like the stuff no matter how many experts tell you to use Pineapple or pepper or even a fancy spray . .. Comes down to it ..the garbage can is more appealing than what some pay hundreds of dollars for over a year ! ..end of the day .. they are just dogs ,and that is a fact .! So if any retort is to which food manufacturer is better or worse , or spouts what nutrition or prolific value in this or that , and "my Daisy loves x brand" then go get a shovel and pick it up. 10 month old pup gets diarrhoea ? ..what 10 month old pup does not now and then >? Effluent water however can be a killer ! .. Not saying that in this case , but I have had a dog die from this , but then I never knew it was effluent at the time . Had dogs for 50 years who drink from a puddle , just said "No" (if they knew the command) and gave them fresh water from my bag . Or back at the truck, just to be on the safe side. btw , all this "urban myth" about slowly changing a dogs diet from one food manufacturer to the next , or kibble to raw , or wet to dry , is a load of ...well Sh*t . ! .. Unless a dog has been consistently fed a particular food such as "chicken base kibble" for years ,day in day out ...then on Thursday you feed it "Beef" ..I am sure it will have a reaction ?..probably the sh*ts for a day or two. I wonder at the Fox or coyote, even the stray dog ..at 10 month old a pup will eat just about anything , given the opportunity and it Should ! .. Carrots are good , btw so is Garlic !! ..(shock horror!) .. well it is a natural tick repellent, ..Just Not very good in ..er like High doses . Your story sounds very familiar to me. I have 4 gundogs at present, but only one has chronic gut issues. When she first got sick about 4 years ago, the vet put her on metronidazole, .......4 times in a row. The dog would be fine while on meds, but the diarrhea, loss of weight and appetite, and distress would return within a week or 10 days of going off the meds. I tried another vet who CULTURED the stool sample, and found that metronidazole was ineffective for what this dog had. We put her on the appropriate antibiotic (Clindamycin), and the dog returned to normal. She is a confirmed eater of any kind of excreta available, along with rotting stuff, and any vegetation which strikes her fancy. The result is that once or twice a year, she ends up on Clindamycin. None of my other dogs are affected like this. We feed probiotics and top notch performance diets from Purina, Nutrisource or Nutrience. I don't know if this dog has gut damage, or what the problem is. She is the only one who gets sick, but all the dogs have the same diet, train in the same areas, and live the same life. Go figure. Glad to hear he is doing better. This is one more reason why we need a "savings for the vet" plan. You said a bone a day. What kind of bone are you feeding? Rawhide? God I hope not. If its a raw meat bone if could be to fatty for his system. Stop the bones completely and see if he gets better.